Gareth - Leader of the Termites? It was reported many moons ago that Walking Dead had caste a character called Gareth. Gareth is not a name of any characters in the Walking Dead comics so up until the Season 4 Finale it has been a bit of mystery. Now we know a good bit more about who Gareth is. Really, we see very little of Gareth in the episode but we can piece together a lot about him by the operation he runs in Terminus. 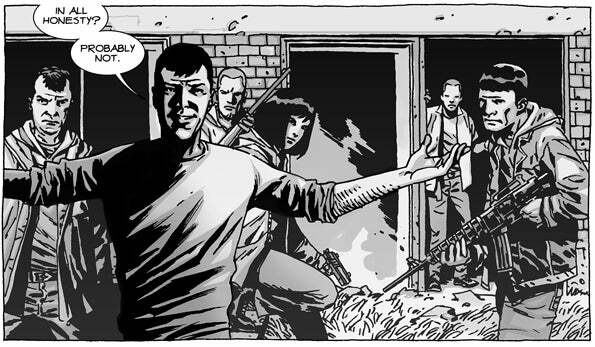 We first meet Gareth when Rick surprises him and the other Termites through their back door. This is effectively a Terminus crisis situation because Rick is not where the Termites want him. Their whole plan is to have people enter the trap from the front. The other termites seem a bit taken aback but Gareth confidently handles the situation. Gareth is not overly alarmed. He makes a joke about someone who should have been guarding the site. He comes across as smooth, friendly, and disarmingly charming. His weapon is his ability to gain people's trust which he seems to be an expert at. He is relatively clean, and clean shaven as are most of the Termites. None of them appear to survivors of the road and wilderness. 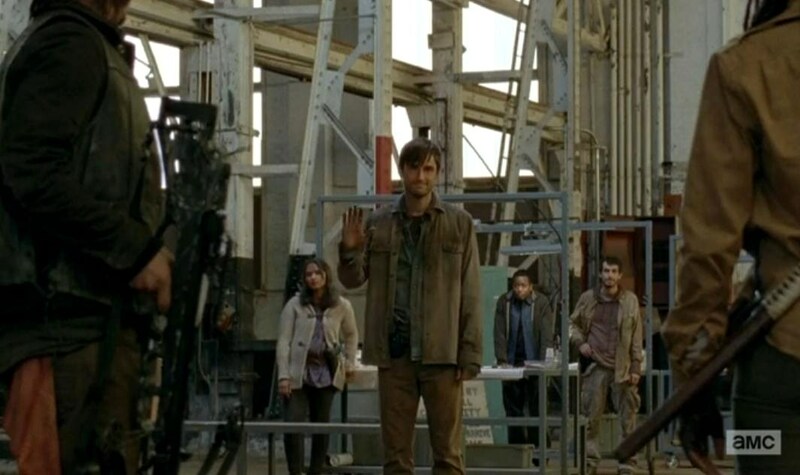 After having his subordinate, Alex do the dangerous job of checking the newcomers for hidden weapons, he then has Alex do the equally dangerous job of leading Rick to the front of Terminus (The front of the trap.) Meanwhile, Gareth seems to quietly extricate himself from the situation like Bugs bunny in a looney toon fray. He never leaves he simply puts himself in a position where he can continue to command but not be in harms way. When Rick figures out that the Termites have his people's stuff and puts a gun to Alex's head, Gareth reemerges on a rooftop. I think this is where we see the REAL Gareth. The friendly mask of Gareth was apparently dropped on his way to the roof. "We have lost your trust"
"What do you want Rick?" "That is not an answer"
Despite the desire of Alex to not get shot, Gareth chooses to not resolve the situation peacefully. He sees that they lost the trust of Rick and rather than letting him go, he gives the signal for his people to pull out their guns and begin shooting. With the goal of pushing Rick into the trap. He rather coolly sacrifices his friend Alex. Alex knows how the trap work and protests to both Gareth and the sniper on the roof to not do anything. I am curious about Gareth's question to Rick, "What do you want?" I wonder what answer he was looking for. The group then runs through the maze and Gareth reemerges at the Kill zone. He threatens to kill Carl if they do not put down their weapons. Once again he shows a fairly strong understanding of people by threatening the child. He does not flounder around he commands confidently and acts like he has done this a thousand times before...and perhaps he has. The way he commands his followers and the victims going through the maze like trap of Terminus lead me to believe that he is both the leader of Terminus and its Mastermind. His ability to read people, mislead them, and manipulate them point toward him being a psychologist, actor, or a salesman before the zombie outbreak. He is likely well educated and a complete sociopath. The Governor violently sought power but occasionally did show signs of humanity. With Gareth I feel like we are dealing with a complete sociopath. He sees all people as means to ends, rather as ends in and of themselves. The Terminus trap extends beyond seeking protection, security, or food it is a disgusting, arrogant way of propping one self up over others. If he used his skills of misdirection more ethically it is possible that Terminus would have truly developed world saving powers. We saw at the farm how quickly production of food could arise in a secure place. In Terminus we see massive amounts of energy being poured into the extortion and butchery of people. This makes the Termites the most despicable of characters. They are also kind of wussies. They do not look like battle hardened road warriors, they seem to depend upon misdirection to lay waste to their foes. It will be interesting to see how many episodes they will last once Rick escapes. Rick has learned how to battle foes in this world in all out warfare. Will the battle against Termites last the entire season 5 or only a couple of episodes? The writers of Walking Dead seem to like expanding upon the comic and enlarge minor subplots at times. Which leads me to believe Terminus will be a prolonged battle. Is there a Gareth like character in the comics? 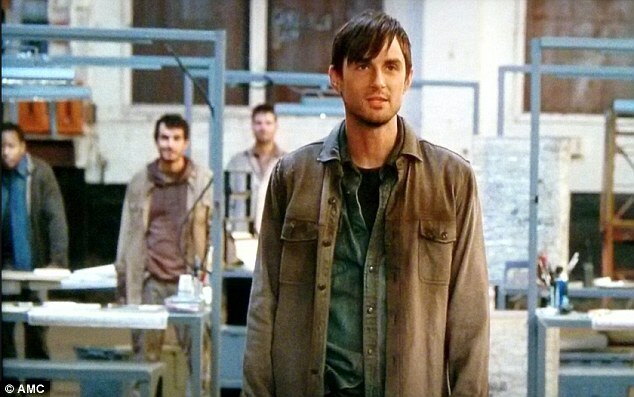 Yes, Gareth seems to be the leader of Terminus a group of cannibals. There is a character named Chris in the TWD comics who is a leader of a group called the Hunters who are also cannibals. This group is basically a bunch of wussies who think it is too hard to hunt animals so they begin to hunt straggler humans instead. They are not a large group but they manage to capture an already wounded Dale. They freak out when they learn that Dale had been bitten after they had already eaten his leg. A still alive but mutilated Dale is dropped off at the Church where Rick and posse is temporarily holed up. An enraged Rick, Michonne and Abraham go off and brutally wipe out the hunters. Things don't go well for the hunters. At one point Andrea even shoots off one of Chris's fingers. The display is enough for them to surrender. At which point Rick and company execute them all. It is one of the most violent actions of the group up until this point in the comics. The Prison crew had been hardened with battle with the Governor and with the Woodbury army. They also were on the road, hungry, angry and desperate. Still the group was very conflicted with the violence unleashed on the hunters and debated about whether it was right or wrong. The hunters are not particularly good fighters or as tough as the Prison crew. They can ambush stragglers or small group of people but when confronted by Rick they are almost instantly slaughtered. In the comics this was not a long drawn out military campaign as with the Governor or later on with Negan and the Saviors. This is Rick finding them and annihilating them. The lines Rick uses before confronting the hunters are nearly identical to lines that he utters when trapped in the Rail Car (Season 4 Finale) at Terminus. Don't mess with Rick. 2) Both are not outdoors/ warrior types of guys. They do not fit the mold of Rick, Tyrese, the Governor, Abraham, or Negan the other major leaders in the comics. Gareth/Chris are more like educated, smarmy, white collar workers who don't want to get their hands dirty. 4) Both seem to be the masterminds of their survival strategy (Cannibalism). 5) Both are relatively clean shaven and slight. 1) Gareth is a larger than life version of Chris. Gareth seems smarter, more insidious, and with more presence than Chris. 2) The resources Gareth has are far vaster than his counterpart Chris. Terminus is huge compared to just about anything we have seen on the show. Chris by contrast ran a single small camp of survivors. 3) Provided Gareth is the mastermind behind Terminus, he is adept at psychology, marketing, and salesman ship. He used these skills to pioneer a path for him and the other wussy termites to thrive in a walker filled world crumbling around them. Chris and the hunters are much simpler and less sophisticated.